Summary: When Emma Montague left the strict confines of upper-crust British life for New York, she felt sure it would make her happy. Away from her parents and expectations, she felt liberated, throwing herself into Manhattan life replete with a high-paying job, a gorgeous apartment, and a string of successful boyfriends. But the cutthroat world of finance and relentless pursuit of more began to take its toll. This wasn’t the life she wanted either. I think I've read everything Jane Green has ever written. In fact, I've been a fan for years. So when I learned that she had a new novel out called FALLING, I couldn't wait to read it. 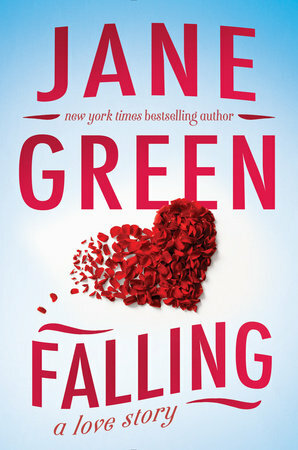 Often times, Ms. Green tackles some serious issues in her books; however, FALLING sounded more like a love story. (Not that a love story isn't a serious topic!) I was hoping to love this one but I admit I had a few doubts because love stories aren't my cup of tea. FALLING tells the story of Emma Montague, a wealthy Brit who left her home country for a job in Manhattan. She seemingly had it all -- a high paying job in finance, a fancy apartment and successful boyfriends; however, she knew this lifestyle wasn't exactly what she wanted. So, Emma picks up and moves to Westport, Connecticut. She has no job and only knows one person, but she has high hopes that she can find happiness. She rents an old cottage from Dominic, an handsome handyman who lives next door with his young son. With a lot of spare time on her hands, she decides to renovate her very dated cottage. Emma finds that she's very attracted to Dominic even though he's unlike any man she's ever dated. She respects his confidence and how attentive he is to his son. They quickly become friends and then more. While Emma tries to talk herself out of the relationship because of some complications, she realizes that Dominic might be exactly what she needs. I enjoyed FALLING but it won't go down as one of my favorite Jane Green novels. I have nothing inherently negative to say about the book, but it was just okay for me. I liked the characters. I loved the setting. And the love story was very sweet. There just wasn't anything that made the book extra-special to me. Having said that, I do think FALLING is a good summer read. For the most part, it's a sweet story with some good tension between Emma and Dominic. I appreciated that the author explored how Dominic's son wasn't quite happy with sharing his father; however, I do think that part of the story was resolved with few complications. In addition, I enjoyed seeing Emma question falling for a man with a background that was so different from her own. What left me a bit unsatisfied, though, was that the characters seemed kind of flat. I'm actually torn with even "going there" because I did like them...a lot. It's just that their actions seemed fairly predictable and there wasn't as much depth to them as I would have liked. I guess I could say that I just wanted a little more complexity from both Dominic and Emma. I never really had the feeling that I truly understood them. Probably my favorite thing about FALLING was Emma. I loved how much she grew throughout the story. Most people would look at Emma's life in Manhattan and think she had a pretty good life. However, Emma wasn't satisfied. She knew she wanted more! It was interesting to see her take a leap of faith by moving to Westport and then start a new business and a new relationship. In addition, I respected her desire to learn more about herself and follow her instincts; and I especially appreciated how she picked herself up even after life's disappointments. In fact, there were so many beautiful life messages in this novel; and I found them to be uplifting and full of hope. I was a little disappointed that I couldn't find a formal discussion guide, but not too disappointed! There is actually quite a bit to discuss in this story, and I don't think your book club would need specific questions to generate discussion. Some of the themes you might love, second chances, parenting, family, self-discovery, trust, friendship, faith, and more! Overall, I think FALLING would make a good summer read. Recommended to fans of Ms. Green's and contemporary women's fiction. It sounds like this might be a good one to take to the beach.